Your now family to a collective set of artists. We are a crew of over 20 eccentric artists and business people. We will then create a log in for you through Weebly.com so you can manage your website. Acknowledge clients presence within 3 seconds of walking through the door by Greeting them. Let them know some one will be with them shortly if busy. Have client fill out Patron Paper Form. This will be Kept in a manila folder upfront in the file cabinet. Artist or Client is then to fill out On-Line Patron Form. This is used for online records. Password will very and is required. Fill out Artist Daily Tattoo Form. This will be used by night shift for On-line End TOTALS. 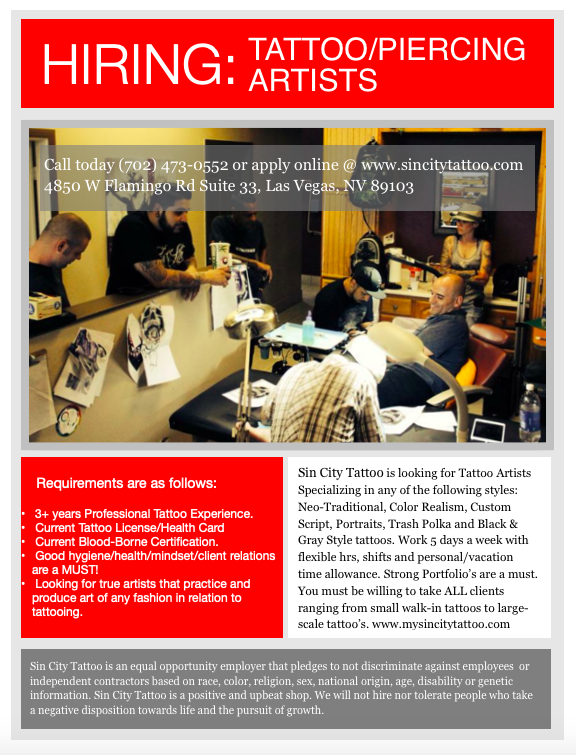 Notice to all those working with the Artistry by Design L.L.C., Las Vegas Ink L.L.C. and Sin City Ink L.L.C., you are required to your SCATS Rights and Responsibilities. View the video at http://4safenv.state.nv.us/resources/rights-responsibilities.